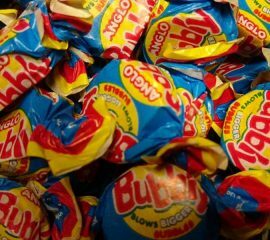 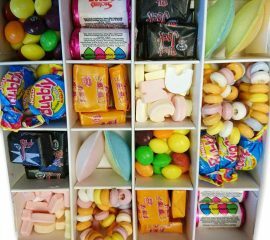 Now this a favourite for anyone who loves their retro choldhood sweets..the chewy black jacks and fruit salads...the sherbet in the dip dabs...the unique taste of the parma violets...well they're ALL in this hamper!! 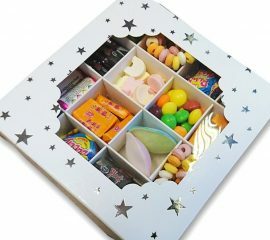 The hamper box is 17.5cm x 17.5cm x 15cm and filled full of sweets that will bring about a smile that's for sure and then we finish it off with a ribbon to make the perfect gift. 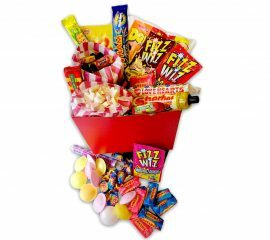 This hamper contains: 100g x ABC Letters 3 x Fizz Wiz 3 x Chew Bars 25 x Flying Saucers 100g x Black Jack Chews 100g x Fruit Salad Chews 1 x Giant Love Hearts 1 x Giant Parma Violets 20 x Anglo Bubbly 50g x Lemon Refresher Chews 50g x Strawberry Refresher Chews 2 x Flump 4 x Drumstick Lollies 1 x Double Dip 1 x Dip Dab 1 x Sherbet Fountain At times we may be out of stock of a particular sweet (not often), when this is the case we will include a suitable substitute of the same great taste and quality!